Welcome back to our blog! 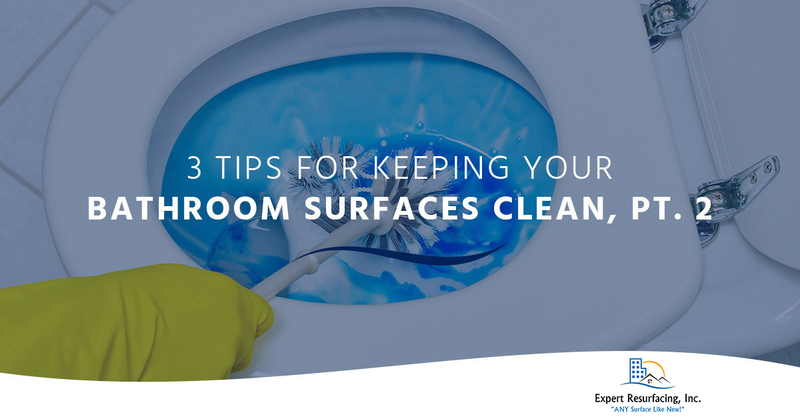 In part one of this blog series, we began looking at some useful tips and tricks for cleaning the surfaces in your bathroom to keep them looking spotless. Whether you have recently had a bathtub resurfacing in your Chesapeake home or simply want to keep your existing bathroom tidy, our pros at Expert Resurfacing have some handy bathroom cleaning and maintenance advice for you to consider. Last time, we recommended soaking your bathroom surfaces in hot water before cleaning them to loosen up grime, deep cleaning your bathtub and sink by spraying cleaner and letting it soak for 10 to 20 minutes, and cleaning your grout with hot water, vinegar, and an old toothbrush. Let’s look at three more cleaning tips for your bathroom surfaces in part two. Many people think that using harsh chemicals and abrasive scrub brushes is the only way to clean their bathroom surfaces, when in fact, all you really need is baking soda and water. For those people who prefer a greener approach to cleaning their bathroom, simply sprinkle baking soda on a damp sponge or cloth to scrub your bathtub, shower, tile, and sink. Rinse with warm water and dry with a cloth for added shine. Vanities come in all styles but one of the most popular styles is a tiled vanity. These areas tend to get the most use and, as a result, often become caked with toothpaste, drips from hair and face products, soap residue, hair, and other debris. To keep your vanity looking superb, wipe it down every day with a cloth, and use a vinegar and water mixture to get rid of spots, fingerprints, and grime stuck on to the grout. We hope you have found these bathroom cleaning tips helpful. Applying these simple cleaning tricks can help maintain the look and texture of your newly resurfaced bathroom fixtures. If the tiled surfaces in your bathroom could use some attention, call Expert Resurfacing! Along with providing Chesapeake with Top Rated Local® bathroom resurfacing, we also specialize in tile reglazing, which can give your vanity, tiled shower, and countertops a cost-effective upgrade without having to replace them. Give us a call today to learn more about our resurfacing and reglazing services, and be sure to tune in for part three of this blog series to learn more bathroom surface cleaning and maintenance tips from the pros!